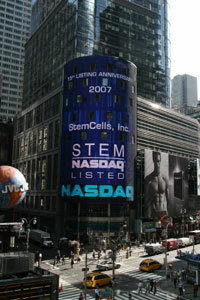 Driven by more than 20 years of pioneering research and innovation, StemCells, Inc. is the undisputed leader in human neural stem cell research and development. As the first ever to conduct a U.S. clinical trial with human neural stem cells, StemCells is the only company, to date, with established human safety and preliminary efficacy data for these cells. The Company’s comprehensive patent portfolio includes seminal technology in cell biology, with neural stem cell patents covering compositions of matter, methods of manufacture and methods of use. Credited with significant breakthroughs in the field, the StemCells team includes internationally renowned experts in stem cell biology, biotechnology, regenerative medicine and cGMP manufacturing.